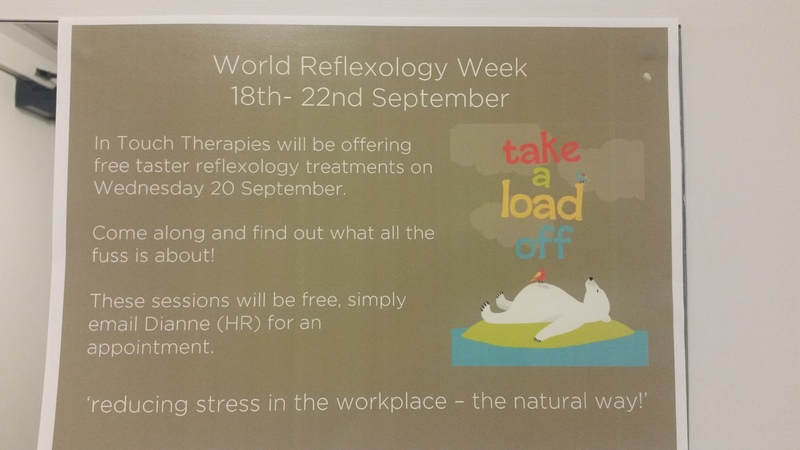 I recently posted about workplace well being sessions and World Reflexology Week. 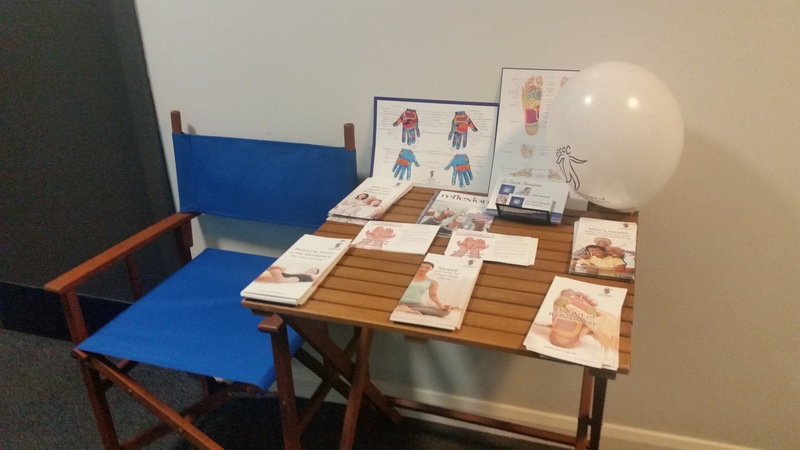 In Touch was able to make good use of this annual event to promote reflexology in a variety of workplaces. In addition the opportunity supported In Touch to make new local connections after recently moving to a new area. The taster treatments for the lucky employees who managed to book a slot were all free so it was win-win all round! 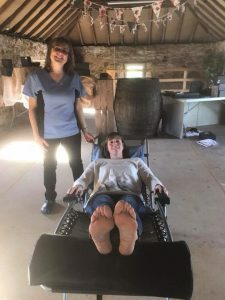 Find out more below about how the events went and how reflexology was received in two very different settings. The Association of Reflexologists (AoR) provided excellent advice and support in relation to setting up the events. I approached four different work settings and I am at differing stages of developing a relationship with them all. The opportunity provided by Word Reflexology Week has moved my relationships and connections further forward with all four settings. It was also a source of valuable learning for me as I grow my business. The AoR advises that having the lever of a national event or initiative can be a useful “hook” into a workplace. I found that it provided a context for why In Touch was offering free treatments. It gave the offer a legitimacy and the professional back drop of the AoR itself lets potential customers know that I am registered with a professional body. 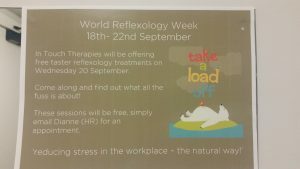 Two of the settings I approached weren’t able to take me up on the offer of free treatments during World Reflexology Week. I was able to suggest that we could do the session on National Stress Awareness day on the 1st November and In Touch is now providing the free treatments and promoting reflexology then instead. My plans for the week had perhaps been a little ambitious as I continued to provide my regular individual and workplace treatments! However, working in two rather than four different settings was manageable alongside my everyday business and was still successful in promoting reflexology and In Touch Therapies. 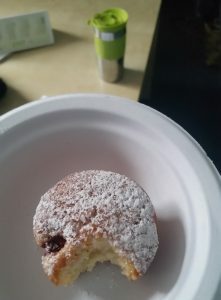 Read on to find out how the taster treatments were received in two very different workplaces. In Touch has been working alongside Queens Cross Housing Association in Glasgow, for 3 years. I have a regular client base there, offering 18 treatments across two days each month. I offered additional reflexology taster treatments for free to promote World Reflexology Week. This was aimed at staff who had not had reflexology before. Following Dianne’s poster campaign and Nicola’s office tour giving motivational chats they were all booked up! I got a chance to offer hand reflexology which I am not often asked for and introduced another 5 members of staff to the benefits of reflexology. At the regular session the following week one of this group of staff booked for a paid treatment. The reception staff always give me a warm and friendly welcome when I arrive with all my bags and I was delighted that two of this team were able to have a free taster treatment. Particularly when one of them arrived with a lovely cake for me, half the way through the event. Perfect timing! This successful afternoon session was followed later in the week by a day at a local farm shop. 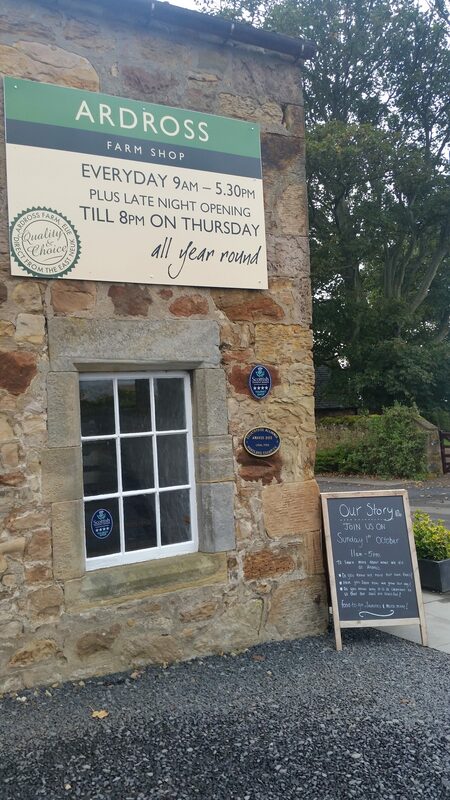 Ardross Farm shop is a family run business near Elie in Fife. 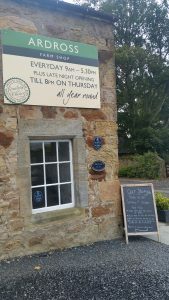 After moving to the area recently I contacted Claire as a start to building my local connections and had a fantastic day meeting the staff team from both the farm and the farm shop. Again I was able to give both hand and foot treatments and I enjoyed the diverse experience of treating both men and women, working in a range of different roles. The team were also a good mix of different age groups. Sometimes it can take a few visits to a workplace before male staff start to come along so it was very positive that men made up nearly half of the attendees on a first visit. 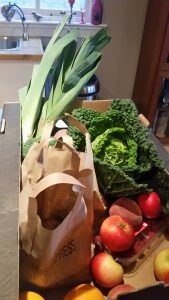 Claire very kindly covered the shop for staff there to get their 30 minute treatments and once again I was well looked after with lovely fresh coffee during the sessions and a fabulous box of fruit and vegetables from the farm at the end of the day! It was a great opportunity for me to contribute to the business community in the area, whilst also letting some more of the locals know that In Touch has moved nearby. So was it is all worth it? Interestingly whether it is a city or a rural work setting, word of mouth is invaluable, despite how much we all use social media for making connections. I got lots of ideas from both settings about different things I could do in the near future to make more connections and I was able to share the benefits of reflexology with a wider audience. So for me holding free events on World Reflexology Week was most definitely worth it. Dr Carol Samuels, a trained reflexologist and member of the Association of Reflexologists carried out her PhD research in this area and the findings were published in the Journal of Complementary Therapies in Clinical Practice. The above article outlines that reflexology could be used to complement conventional drug therapy in the treatment of conditions associated with pain such as osteoarthritis, backache and cancers. Over half of my clients experience pain on a regular basis and have reported that reflexology has alleviated this discomfort. In order to explore this further I hope to undertake series of treatments focusing specifically on the pain experienced by a client who has osteoarthritis. Watch this space for updates on their progress and feedback. Given the busy run up to Christmas the chance to stop the world and relax with a treatment is the perfect Christmas gift. 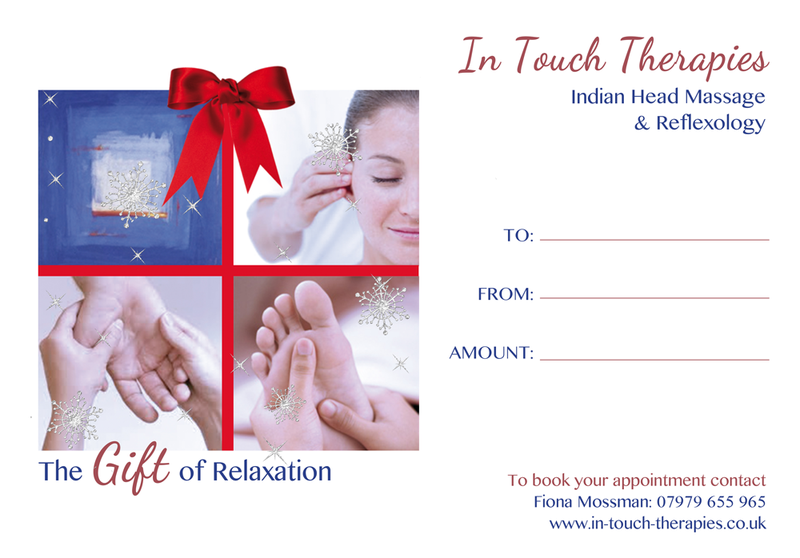 In Touch would recommend Indian Head Massage as a relaxing treatment to recover from the festive period. 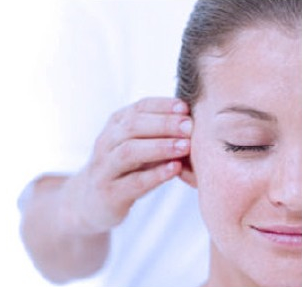 Head massage focuses on the scalp, neck, shoulders and back to ease aches, pains and tension in these areas. The use of essential oils and balms during massage promotes relaxation on a deeper level and is the perfect antidote for all the excesses of Christmas. Coming soon….watch this space to be able to pay for and download your own vouchers!